CRM retargeting is a relatively new marketing approach that allows brands to send targeted messages to people online using their customer database. It’s different from regular retargeting because it uses customer information that has been collected offline, such as CRM data. You can think of CRM retargeting as a marriage of online and offline marketing for brands to seamlessly communicate with their audience. Customer relationship management, which is better known as CRM, is a vital tool that assists businesses with everything from boosting their profit margin to offering timely technical support. In a nutshell, a CRM system provides automated responses and marketing techniques that are tailored toward the company’s existing customer base. 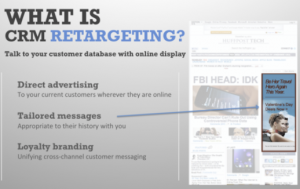 What is CRM Retargeting For? A CRM can be used for different purposes, such as managing the sales process, following up individual pipelines, giving a weighted sales projections. Another important role of CRM consists in email marketing. The CRM will give you the possibility to create different segments of your lists based on your needs. Segments allow you to personalize emails on a massive scale with the minimum effort. A good CRM will also provide you with a robust automation, to trigger emails, reminders, appointments, and much more based on predetermined criteria. In fact, automation capabilities are so important for a successful marketing strategy, that I would not recommend investing in a CRM that does not provide automation capabilities. CRM Retargeting allows you to get your message in front of your buyers by using your offline customer database. hen your customer or prospect is on the internet the ad network will display a customized targeted message. You can segment your CRM database into any number of actionable segments that can be based on demographics, R-F-M , prior behavior, geography, clusters based, etc. You can A/B split each segment and test different creatives/offers to determine the optimal approach. You can use a display ad network to plan the ad campaign and place the ads with web sites. If you do not have a preferred ad network, Anchor has trusted ad network partners who will work with you on the ad buy, perform the account management function, and provide the results and metrics. Anchor accesses client’s database of email addresses and/or name and address. Anchor segments client’s a database and forwards the file for the assignment of cookies. The ad network deploys the campaign. The client can set test limits on the number of impressions. Match rates for cookie delivery of a typical client’s CRM database will be in the 30%-60% range. The optimal number of ad frequency impressions delivered to the CRM database is 17 impressions per month per individual. Anchor then works with the client in analyzing all the results and making recommendations for future roll-outs.